My research program focuses on developmental and environmental factors and vineyard management practices as they influence crop physiology of wine and juice grapes. As outlined below, my lab investigates scion-rootstock interactions, grape development and water relations during fruit ripening, irrigation and crop load management, yield formation, and cold hardiness. Irrigation during the grapes’ ripening phase is prohibited by law in many European countries and is often discouraged by wineries even in the new world for fear the extra water might be taken up by the grapes and dilute their quality. Surprisingly, there is little scientific evidence that late-season water uptake by the roots is detrimental to fruit quality. We are using innovative techniques to investigate how water moves into and out of grape berries and whether such water movement leads to changes in berry size and solute concentration. This work is done in collaboration with the WSU grape physiologist Dr. Bhaskar Bondada and is funded by the USDA Northwest Center for Small Fruits Research. A relatively new phenomenon is plaguing grape growers up and down western North America from California to British Columbia. Grape berries, especially of the varieties Cabernet Sauvignon and Sauvignon blanc, sometimes appear to stop ripening shortly after veraison and remain sour with low sugar, color and flavor but high astringency. In contrast to the better known bunch-stem necrosis, the rachis tissues remain green until well after the berries have begun to shrivel. The problem is also known in Europe, although often under the name “Zweigelt disease”, because it was first reported on this variety. 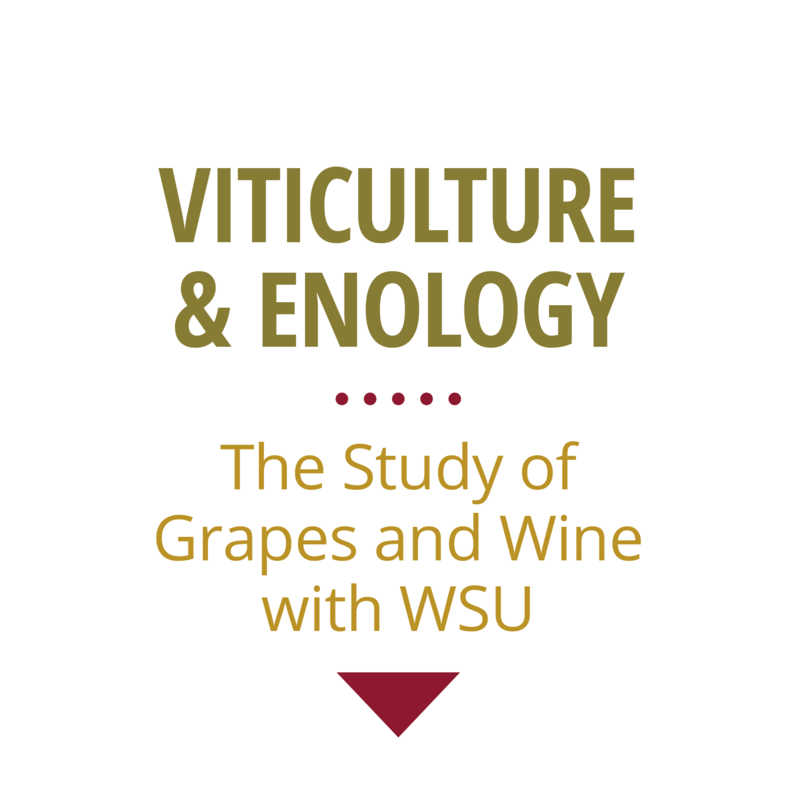 In collaboration with the WSU grape physiologistDr. Bhaskar Bondada we are trying to uncover the causes for this syndrome, so that we may develop potential remedies. This research is funded by the Washington wine tax. Concord juice producers face stiff competition nationally and internationally, which results in very small profit margins for the growers. We are testing the establishment and performance of Concord grapes planted at various distances both within and between vineyard rows with the aim to consistently maximize crop production while maintaining desirable fruit quality. This project is funded by the juice processors through the Washington State Concord Grape Research Council. Washington’s occasional cold winters make wind machines or heating devices in vineyards a necessary but costly investment. In extreme cases, not running a wind machine during a cold episode can result in vines being killed to the ground, while running one unnecessarily is a waste of time and money. We test the changes in cold hardiness of buds and cane tissues of a range of grapevine varieties throughout each winter season. The information on critical temperatures is updated weekly, so that growers can use it to determine when frost protection measures should be initiated. Funding for this service activity comes from Washington’s grape growers, winemakers and juice processors through the Washington Association of Wine Grape Growers, Washington Wine Industry Foundation and the Washington State Concord Grape Research Council. Ferguson, J.C., M.M. Moyer, L.J. Mills, G. Hoogenboom and M. Keller. 2014. Modeling dormant bud cold hardiness and budbreak in twenty-three genotypes reveals variation by region of origin. Am. J. Enol. Vitic. 65: 59-71. Keller, M. and P.M. Shrestha. 2014. Solute accumulation differs in the vacuoles and apoplast of ripening grape berries. Planta 239: 633-642. Casassa, L.F., R.C. Larsen, C.W. Beaver, M.S. Mireles, M. Keller, W.R. Riley, R. Smithyman and J.F. Harbertson. 2013. Impact of extended maceration and regulated deficit irrigation (RDI) in Cabernet Sauvignon wines: Characterization of proanthocyanidin distribution, anthocyanin extraction, and chromatic properties. J. Ag. Food Chem. 61: 6446-6457. Casassa, L.F., R.C. Larsen, C.W. Beaver, M.S. Mireles, M. Keller, W.R. Riley, R. Smithyman and J.F. Harbertson. 2013. Sensory impact of extended maceration and regulated deficit irrigation on Washington state Cabernet Sauvignon wines. Am. J. Enol. Vitic. 64: 505-514. Bondada, B.R. and M. Keller. 2012. Not all shrivels are created equal – morpho-anatomical and compositional characteristics differ among different shrivel types that develop during ripening of grape (Vitis vinifera L.) berries. Am. J. Plant Sci. 3: 879-898. Bondada, B.R. and M. Keller. 2012. Morphoanatomical symptomatology and osmotic behavior of grape berry shrivel. J. Am. Soc. Hort. Sci. 137: 20-30. Harbertson, J.F. and M. Keller. 2012. Rootstock effects on deficit-irrigated winegrapes in a dry climate: Grape and wine composition. Am. J. Enol. Vitic. 63: 40-48. Keller, M., L.J. Mills and J.F. Harbertson. 2012. Rootstock effects on deficit-irrigated winegrapes in a dry climate: Vigor, yield formation, and fruit ripening. Am. J. Enol. Vitic. 63: 29-39. Widrlechner, M.P., C. Daly, M. Keller and K. Kaplan. 2012. Horticultural applications of a newly revised USDA Plant Hardiness Zone Map. HortTechnology 22: 6-19. Ferguson, J.C., J.M. Tarara, L.J. Mills, G.G. Grove and M. Keller. 2011. Dynamic thermal time model of cold hardiness for dormant grapevine buds. Ann. Bot. 107: 389-396. Hall, G.E., B.R. Bondada and M. Keller. 2011. Loss of rachis cell viability is associated with ripening disorders in grapes. J. Exp. Bot. 62: 1145-1153. Tarara, J.M., J.E. Perez Peña, M. Keller, R.P. Schreiner and R.P. Smithyman. 2011. Net carbon exchange in grapevine canopies responds rapidly to timing and extent of regulated deficit irrigation. Funct. Plant Biol. 38: 386-400. Keller, M. 2010. The Science of Grapevines – Anatomy and Physiology. Elsevier: Academic Press, Burlington, MA. Keller, M. 2010. Managing grapevines to optimise fruit development in a challenging environment: a climate change primer for viticulturists. Aus. J. Grape Wine Res. 16: 56-69. Keller, M. and J.M. Tarara. 2010. Warm spring temperatures induce persistent season-long changes in shoot development in grapevines. Ann. Bot. 106: 131-141. Davenport, J.R., M. Keller, and L.J. Mills. 2008. How cold can you go? Frost and winter protection for grape. HortScience 43: 1966-1969. Hagen, K.M., M. Keller, and C.G. Edwards. 2008. Survey of biotin, pantothenic acid, and assimilable nitrogen in winegrapes from the Pacific Northwest. Am. J. Enol. Vitic. 59: 432-436. Keller, M. 2008. Traubenwelke: auch in den USA ungelöst. Schweiz. Z. Obst. Weinbau 144: 6-8. Keller, M., R.P. Smithyman, and L.J. Mills. 2008. Interactive effects of deficit irrigation and crop load on Cabernet Sauvignon in an arid climate. Am. J. Enol. Vitic. 59: 221-234. Keller, M. and L.J. Mills. 2007. Effect of pruning on recovery and productivity of cold-injured Merlot grapevines. Am. J. Enol. Vitic. 58: 351-357. Ross, C., H. Ferguson, M. Keller, D. Walsh, K. Weller, and S. Spayd. 2007.Determination of ortho-nasal aroma threshold for multicolored Asian lady beetle in a Concord grape juice. J. Food Quality 30: 855-863. Tesic, D., M. Keller, and R. Hutton. 2007. Influence of vineyard floor management practices on grapevine growth, yield, and fruit composition. Am. J. Enol. Vitic. 58: 1-11. Holzapfel, B.P., J.P. Smith, R.M. Mandel, and M. Keller. 2006. Manipulating the postharvest period and its impact on vine productivity of Semillon grapevines.Am. J. Enol. Vitic. 57: 148-157. Keller, M., J.P. Smith, and B.R. Bondada. 2006. Ripening grape berries remain hydraulically connected to the shoot. J. Exp. Bot. 57: 2577-2587. Mills, L.J., J.C. Ferguson, and M. Keller. 2006. Cold hardiness evaluation of grapevine buds and cane tissues. Am. J. Enol. Vitic. 57: 194-200. Rogiers, S.Y., D.H. Greer, J.M. Hatfield, B.A. Orchard, and M. Keller. 2006. Mineral sinks within ripening grape berries (Vitis vinifera L.). Vitis 45: 115-123. Rogiers, S.Y., D.H. Greer, J.M. Hatfield, B.A. Orchard, and M. Keller. 2006. Solute transport into Shiraz berries during development and late-ripening shrinkage.Am. J. Enol. Vitic. 57: 73-80. Keller, M. 2005. Deficit irrigation and vine mineral nutrition. Am. J. Enol. Vitic. 56: 267-283. Keller, M., L.J. Mills, J.M. Tarara, and J. Ferguson. 2005. Effects of budbreak temperature on seasonal shoot and fruit growth in grapevines. Acta Hort. 689: 183-188. Keller, M., L.J. Mills, R.L. Wample, and S.E. Spayd. 2005. Cluster thinning effects on three deficit-irrigated Vitis vinifera cultivars. Am. J. Enol. Vitic. 56: 91-103. Tarara, J.M., J.E. Perez Peña, and M. Keller. 2005. Using whole-vine photosynthesis to understand the effects of water deficit on premium wine grapes. Acta Hort. 689: 301-307. Keller, M., L.J. Mills, R.L. Wample, and S.E. Spayd. 2004. Crop load management in Concord grapes using different pruning techniques. Am. J. Enol. Vitic. 55: 35-50. Keller, M. and N. Torres-Martinez. 2004. Does UV radiation affect winegrape composition? Acta Hort. 640: 313-319. Rogiers, S.Y., J.M. Hatfield, and M. Keller. 2004. Irrigation, nitrogen, and rootstock effects on volume loss of berries from potted Shiraz vines. Vitis 43: 1-6. Rogiers, S.Y., J.M. Hatfield, V.G. Jaudzems, R.G. White, and M. Keller. 2004. Grape berry cv. Shiraz epicuticular wax and transpiration during ripening and preharvest weight loss. Am. J. Enol. Vitic. 55: 121-127. Viret, O., M. Keller, V.G. Jaudzems, and F.M. Cole. 2004. Botrytis cinerea infection of grape flowers: light and electron microscopical studies of infection sites. Phytopathology 94: 850-857. Wade, J., B. Holzapfel, K. Degaris, D. Williams, and M. Keller. 2004. Nitrogen and water management strategies for wine-grape quality. Acta Hort. 640: 61-67. Keller, M., S.Y. Rogiers and H.R. Schultz. 2003. Nitrogen and ultraviolet radiation modify grapevines’ susceptibility to powdery mildew. Vitis 42: 87-94. Keller, M., O. Viret, and F.M. Cole. 2003. Botrytis cinerea infection in grape flowers: defense reaction, latency, and disease expression. Phytopathology 93: 316-322. Keller, M., M. Kummer, and M.C. Vasconcelos. 2001. Soil nitrogen utilisation for growth and gas exchange by grapevines in response to nitrogen supply and rootstock. Aus. J. Grape Wine Res. 7: 2-11. Keller, M., M. Kummer, and M.C. Vasconcelos. 2001. Reproductive growth of grapevines in response to nitrogen supply and rootstock. Aus. J. Grape Wine Res. 7: 12-18. Rogiers, S.Y., J.A. Smith, R. White, M. Keller, B.P. Holzapfel, and J.M. Virgona. 2001.Vascular function in berries of Vitis vinifera (L) cv. Shiraz. Aus. J. Grape Wine Res. 7: 47-51. Keller, M., C.C. Steel, and G.L. Creasy. 2000. Stilbene accumulation in grapevine tissues: developmental and environmental effects. Acta Hort. 514: 275-286. Rogiers, S.Y., M. Keller, B.P. Holzapfel, and J.M. Virgona. 2000. Accumulation of potassium and calcium by ripening berries of field vines of Vitis vinifera (L) cv. Shiraz. Aus. J. Grape Wine Res. 6: 240-243. Steel, C.C. and M. Keller. 2000. Influence of UV-B irradiation on the carotenoid content of Vitis vinifera tissues. In Harwood J.L. and P.J. Quinn (Eds. ): Recent Advances in the Biochemistry of Plant Lipids. Portland Press, London, pp. 883-885. Keller, M., R.M. Pool, and T. Henick-Kling. 1999. Excessive nitrogen supply and shoot trimming can impair colour development in Pinot Noir grapes and wine. Aus. J. Grape Wine Res. 5: 45-55. Keller, M., K.J. Arnink, and G. Hrazdina. 1998. Interaction of nitrogen availability during bloom and light intensity during veraison: I. Effects on grapevine growth, fruit development, and ripening. Am. J. Enol. Vitic. 49: 333-340. Keller, M. and G. Hrazdina. 1998. Interaction of nitrogen availability during bloom and light intensity during veraison: II. Effects on anthocyanin and phenolic development during grape ripening. Am. J. Enol. Vitic. 49: 341-349. Koblet, W., M.C. Candolfi-Vasconcelos, and M. Keller. 1996. Stress und Stressbewältigung bei Weinreben. Bot. Helv. 106: 73-84. Keller, M., B. Hess, H. Schwager, H. Schärer, and W. Koblet. 1995. Carbon and nitrogen partitioning in Vitis vinifera L.: Responses to nitrogen supply and limiting irradiance. Vitis 34: 19-26. Keller, M. and W. Koblet. 1995. Dry matter and leaf area partitioning, bud fertility and second-season growth of Vitis vinifera L.: Responses to nitrogen supply and limiting irradiance. Vitis 34: 77- 83. Keller, M. and W. Koblet. 1995. Stress-induced development of inflorescence necrosis and bunch stem necrosis in Vitis vinifera L.: Responses to environmental and nutritional effects. Vitis 34: 145- 150. Keller, M. and W. Koblet. 1995. How do grapevines respond to nitrogen supply under limiting irradiance? Acta Hort. 427: 129-131. Koblet, W., M. Keller, and M.C. Candolfi-Vasconcelos. 1995. Effects of training system, canopy management practices, crop load and rootstock on grapevine photosynthesis. Acta Hort. 427: 133-140. Keller, M. and W. Koblet. 1994. Is carbon starvation rather than excessive nitrogen supply the cause of inflorescence necrosis in Vitis vinifera L.? Vitis 33: 81-86. Candolfi, M.P., M. Keller, and E.F. Boller. 1991. Mite-load function improves precision of feeding damage estimation in Tetranychus urticae. Entomol. Exp. Appl. 58: 289-293.